The True Gossip Home / BRANDI CYRUS- "MILEY GOT EXCITED"
BRANDI CYRUS- "MILEY GOT EXCITED"
Brandi Cyrus, Miley's older sister, updated her blog recently by saying, "Justin and Miley asked Sam and I to go out for Sushi and a movie! It was a nice relaxing night and we all finally got a chance to hang out. Sushi isn't my favorite.... but the Mochi was good! 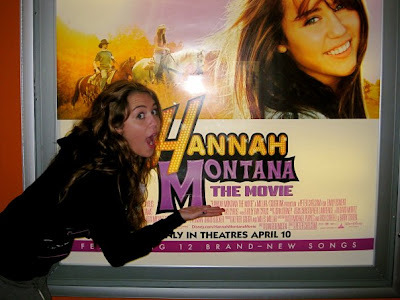 And at the theater Miley got excited seeing the movie poster for the first time!" Nice! Go check out "Hannah Montana The Movie" in theaters April 10!